He will respond to you, just keep in mind that he is a solo show, which means he isn't just waiting at his desk for your email to roll in. Be reasonable and respectful and he will take care of your needs by treat you well. From time to time I come out the shadows to defend Metadyne and the extremely small production he has. I have no affiliation to him or his company other than the respect I have gained over the years for the products he makes, but more importantly how he stands behind the items and how he always will make things right. I throw his out as something to think about before drawing a skewed perception based upon misunderstandings and half truths. Before I begin, I just want to recap an earlier fix for the Thumper that joedirt and I (and others) seem to have discovered independently of one another: Use an inline reg with you Thumper! Adding an inline reg is an outstanding solution to keeping your Thumper up and running. This is described in detail below. It is also a good idea to replace all your Thumper's o-rings out of the box, as a good number of them seem to have come with poor quality seals from the factory ($5 dollars is a small price to pay for reliability). Many of the correct o-rings can be found in an EGO o-ring kit. If you want a list of all the necessary o-ring sizes or a good source, shoot me a pm. If you can, try to get 80 or 90 durometer o-rings. I have only tried using 70 durometer, but Woouulf speculates that the higher durometer might help a whole lot. From what I have experienced that seems absolutely right. 90% of people who have bought the Metadyne Thumper (Gen 1 and 2) seem to have had problems. Something goes wrong and they don't fire properly. The actuating valve breaks down or the main valve/piston fails, splitting in half at the front most o-ring groove. I long hypothesized that the problem was related to flaws in the design or manufacturing of the gun's internal reg system. I did not play with my Thumper for one or two months after I got it. I was again hoping Metadyne or someone would figure out a way to somehow fix all of the gun's potential for problems awaiting me when I aired it up for the first time. Thankfully, with the help of many folks from MCB, I have been able to avoid any discomfort and take fully advantage of a wicked, somewhat radical pump. No problems at all! I had already set my 2L's output to 250psi, and had to adjust it up to about 275psi to achieve 290fps. A quarter case later (500-600 shots) and I was walking around with a **** eating grin smeared across my mug for the rest of the day. Since then I've purchased another Thumper, one that had broken down with it's previous owner. I did the same things I did to my first one, replacing all o-rings, properly lubing her up and adding a good lp inline reg (this time an AKA Sidewinder also set around 260psi). The following would have been so much easier and cleaner if I had some sort of CAD program on this computer, but, alas, Paint works. The diagram on the left illustrates the position of the reg piston when marker is NOT PRESSURIZED. 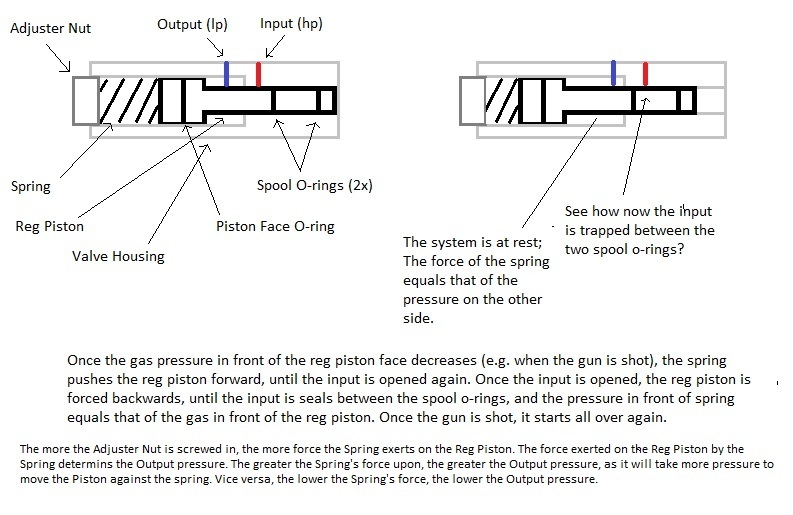 The one of the right illustrates what the piston looks like when the marker IS pressurized and the reg piston is at equilibrium under pressure. -ALWAYS make sure to check o-rings when cleaning or servicing the gun to make sure they're still in good condition. This is true especially when your Thumper is running on it's original from Metadyne seals or have recently replace the original seals with new ones. Remember to use a good lube such as magnalube. -Oil type liquid lubricants are frowned upon, as the manufacturers of the actuating valve state that it is meant to run dry. Some folks haven't had any problems with using this, but you do run the risk of compromising your actuating valve, forcing you to replace it completely ($5-20 I think depending on where you get it). -This last section will be updated as I people share their positive experiences fixing, tweaking and/or upgrading. Speaking of it, I want to thank Woouulf, Joedirt and everyone else who has contributed the Thumper achieving it's rightful destiny. What destiny you ask? AWESOMENESS! 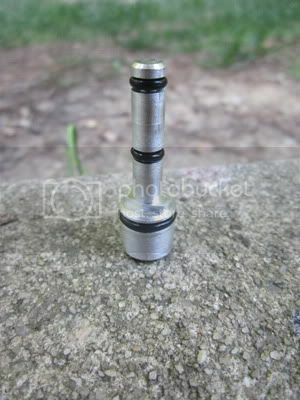 Who wants to get the Newest Beefiest Piston yet for the Thumper? You do have to send your Thumper (or rather it's main body section) in to Metadyne to get it upgraded. If you don't mind a little lag time and are patient by nature (or want to learn) this is a great opportunity to avoid having to use an inline reg to prevent your Thumper from breaking down. That means you can run it off 12g and play stock class without any worries, like it was intended! Yippee!!! Disclaimer: I'm not perfect. If this isn't how the reg piston works or I don't have the right o-ring sizes posted, well, I hope someone will point that out. Last edited by toymachine; 11-01-2012 at 07:50 PM.